Hope College’s annual major dance concert, Dance 38, will open on Friday, Feb. 24, and continue on Saturday, Feb. 25, and Thursday-Saturday, March 1-3. All performances start at 8 p.m. at the Knickerbocker Theatre in downtown Holland. The concert includes a diverse group of works choreographed by Hope College’s dance faculty, including Matthew Farmer, Crystal Frazier, Steven Iannacone, Amanda Smith-Heynen and Angie Yetzke. The performance will also feature additional pieces created by guest artists including Anne René Petrarca and Sharon Wong. Anne René Petrarca’s untitled work depicts the journey of a community in which desperate factions break into individual interactions. Self knowledge and group consensus ultimately contribute to the forward motion of life. “Seasons,” choreographed by Crystal Frazier, is an upbeat look at time and change through the art of tap dance. “Conversations,” choreographed by Sharon Wong, kinetically explores the interpretations and reactions to the myriad of conversations that occur within any given space or location. “Circo Piccolo,” choreographed by Steven Iannacone, is exactly that, “a little circus” somewhere back in time, threadbare and worn, just managing to get by as the “need” for the circus becomes outdated. “Out of Ash,” choreographed by Matthew Farmer, is a driving dance piece inspired by the unconquerable human spirit. Set to some of Aaron Copland’s most renowned music, the piece is aims to be visually and emotionally inspirational. “Julio’s Cheekbones,” choreographed by Angie Yetzke in collaboration with Grand Rapids composer Chris Eddy, creates original sound for a story of unrequited love. Through the interweaving of voice and movement, the dancers explore the imagery of the poem “something that you should know,” by Cecilia Borromeo. 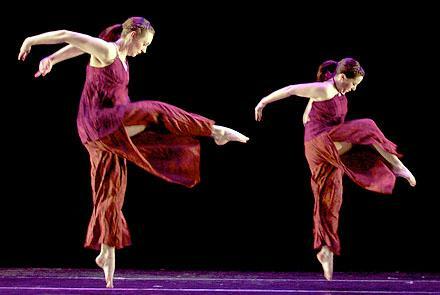 Also on the program is a contemporary ballet piece by Amanda Smith Heynen. Guest choreographer Anne-René Petrarca is a modern dancer, choreographer and certified Alexander Technique teacher. In New York City she was on the faculty at Dance New Amsterdam and the assistant faculty at The Juilliard School. Recently, Petrarca was a visiting artist at Sarah Lawrence College and Long Island University-Brooklyn. In San Francisco, she is on the faculty at Alonzo King Lines Dance Center, Alonzo King Lines Ballet Training Program and Shawl-Anderson Dance Center. Sharon Wong is currently the chair of the jazz department and a faculty advisor at Ailey School. She serves as a guest educator at the Atlanta Ballet Summer Intensive; Earl Mosley’s Institute for the Arts Summer School in Kent, Conn.; and the Jean M. Wong School of Ballet Summer Intensive in Hong Kong; and recently completed her sixth residency in the department of dance at Hope, where she taught several levels of both modern and jazz. Costumes are designed by Darlene K. Christopher, Susan Eyler and Amanda Vander Byl. The lighting and set designs are by Erik Alberg. Tickets for Dance 38 are on sale at the ticket office in the main lobby of the DeVos Fieldhouse, and cost $10 for regular admission, $7 for senior citizens and $5 for students. The ticket office is open weekdays from 10 a.m. to 5 p.m., and can be called at (616) 395-7890. The Flying Dutchmen have been picked to finish second behind defending champion Adrian in the first-ever pre-season poll of MIAA baseball coaches. Dr. Mark Husbands of the Hope College religion faculty will present a public lecture on doing Christian Theology in a Secular Age titled “Do Not Go Gentle Into that Good Night,” on Tuesday, Feb. 21, at 7 p.m. in the Maas Center auditorium.